FLAKE, Floyd Harold, a Representative from New York; born in Los Angeles, Calif., January 30, 1945; attended public schools in Houston, Tex. ; B.A., Wilberforce University, Wilberforce, Ohio, 1970; attended Northeastern University, Boston, Mass., 1974-1976, and St. John's University, Jamaica, N.Y., 1980-1984; M. Div., United Theological Seminary, Dayton, Ohio, 1995; pastor of Allen A.M.E. Church, Jamaica, N.Y., 1976-1986; unsuccessful candidate in 1986 for the vacancy in the Ninety-ninth Congress caused by the death of Joseph P. Addabbo; elected as a Democrat to the One Hundredth and to the five succeeding Congresses and served from January 3, 1987, until his resignation November 17, 1997, to return full time to his duties as pastor of Allen A.M.E. Church. 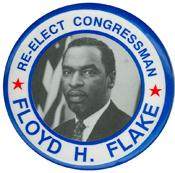 Floyd Harold Flake in Black Americans in Congress, 1870-2007. Prepared under the direction of the Committee on House Administration by the Office of History & Preservation, U. S. House of Representatives. Washington: Government Printing Office, 2008.